Many houses in Logan are in poor condition. On some streets boarded-up windows are as common as glass ones. Factories are abandoned, crumbling, and filled with graffiti. Most of these structures were built in the late 1800s and early 1900s. One building, however, stands out among the row homes. 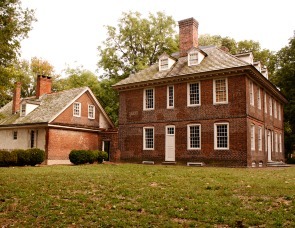 The simple brick building in the corner of Stenton Park was the home of James Logan, and it was built in the 1720s. James Logan played a major role in the early years of Philadelphia. “He is often overlooked,” said Dennis Pickeral, the director of Stenton. Logan came to the colonies with William Penn. He acted as Penn’s agent after Penn returned to England. During Logan’s earlier years he was an acting governor, chief justice, a member of the Provincial Council, and the mayor of Philadelphia. Logan was also, in a sense, a mentor to Ben Franklin. The two shared a love of learning and were lifelong friends. Although Logan wielded considerable political power, he made little money from it. A majority of his wealth came from fur trade and real estate. At the time of his death in 1751, Logan owned nearly 18,000 acres of land throughout Pennsylvania and New Jersey. He had Stenton built in the 1720s as a country home and moved there permanently in his elder years. The name Stenton comes from his father’s birthplace in Scotland. The house remained the home of three generations of Logans. The 500-acre estate was gradually broken up. Today, the sprawling fields and farms that stretched from Logan’s country getaway have been reduced to three acres. The house sits in the corner of Stenton Park, guarded by high vine-covered fences and towering trees. “There’s a perception that this area is dangerous,” says Pickeral. “That’s the biggest obstacle to overcome.” Stenton boasts an impressive collection of Colonial artifacts and offers a wealth of information, but foot traffic could be better. There are about 5,000 visitors a year, half of which are school students. The location of the house plays a major part in visitation: it’s apart from other historical sites. Pickeral said sites like Stenton suffer from decreasing revenue and decreasing relevance in their communities. He said it’s important to address the needs of the community and the different audiences that the site serves. To address these issues, Stenton has become a part of the History Hunters program. The program helps underprivileged kids by providing free transportation and tours of multiple historic sites in the area. “Our goal is getting neighbors involved,” Pickeral said. In addition to the History Hunters, Stenton's staff is involved in trying to convert a vacant neighboring building into a community garden. The empty factory rises ominously above the park. The staff is also an active voice in the rehabilitation of the Wayne Junction train station, which is just a few blocks away. To draw visitors, Stenton hosts special events throughout the year, such as an Easter egg hunt in the spring and ghost tours in the fall. The staff has been successful in boosting visitation, but other sites are doing more. “Stenton hasn’t gone out of its way to be more than a historical site,” said Stenton curator Laura Keim. Various stops in Germantown host farmers' markets and other houses focus on attractive exteriors and providing a broad learning experience. Stenton has remained relatively exclusive in its focus on Logan family and the restoration of artifacts—an aspect that keeps the experience narrow, but offers the most authentic look into the past. As the surrounding neighborhood continues to fall to neglect, Stenton continues to grow. The staff is working hard to keep the nearly 300-year-old house current. More children and neighbors are discovering the relic and realizing that the past can be a way to create hope for the future. This article was written and reported by Alex Onkow and Stacey Naughton for Philadelphia Neighborhoods, a publication of Temple University's Multimedia Urban Reporting Lab, and originally published on Dec. 8, 2010.